First Ride Catrike 700 "Red"
I cut short my planned 20 mile first ride on my Catrike 700 "Red". The right brake caliper was poorly aligned my yours truly and I didn't want to stop on the road to re-align it. I tolerated the annoying noise emitting from the right brake all the way to JRA's Bike and Brew and met Carrie for a coffee and tea and then a lift home. The caliper is now aligned for the next ride. Everything else checked out perfect except for my helmet. My road helmet with the exaggerated point in the back kept hitting the front of the pannier rack. 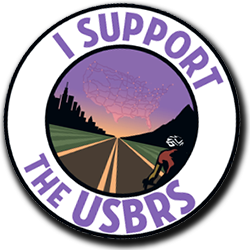 I kinda expected it but I wanted to test it out before I popped on a new recumbent friendly helmet. After a couple more rides I'll compare the "Red" with my Catrike 700 "Black". For now I will say it was a short but sweet ride. I look forward to many more rides on this awesome machine. My new Catrike 700 aka "Red" is ready to roll. My Catrike 700 "Red" is set up for cruising, riding trails and touring. As pictured below, ready to ride with bags, lights and light batteries it weights in at 46 pounds. As a comparison my old Catrike Expedition weighted in at 55 pounds. My Catrike 700 "Black" (my light and fast trike) weights in at 32 pounds (also including bags and lights). The weights do not include tool kits, extra tubes and personal items. I won't be using a trunk bag so this is the final set up. I removed the top chain tube allowing for a clean chain line. I don't like the stock Catrike chain tube setup. Catrike attaches the top tube directly to the bottom tube which doesn't allow for independent movement of the chain tubes. Lifeproof cradle for iPhone 4s with it's Lifeproof case. I removed the quick release on the headrest to allow room for the larger tire (37-622) and fender. Ortlieb Back Roller pannier on the Tubus Logo Evo Rack on my Catrike 700 "Red. The pannier mounts low and towards the rear on the Tubus Rack. The welded tab at the rear of the rack prevents the pannier from sliding back. The pannier is clear of the derailleur. (The derailleur is fully retracted as the chain is not connected). 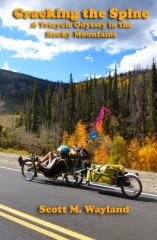 The inward camber of the rack at the top keeps the pannier load closer to the center of the trike. Better shot of the camber on the Tubus rack. As I mentioned in my last post the Tubus does not work well with conventional trunk bags because of the narrow top platform. This is how to eliminate the trunk bag and pile on the load. Almost done putting my Catrike 700 "Red" together. Waiting on a couple of minor parts to finish. Tubus Logo Evo rack. The side rails of the rack lean inward at the top bringing the load closer the center line of the trike for better stability. The geometry of the Tubus Evo makes for a super solid rack. The fender has only two attachment points and is rock solid tucked under the rack. The top of a Tubus rack is typically used to lash down large bags. The shortened rear fender mounts to the Tubus rack so there are no flimsy struts attached from the frame to the fender. The DiNotte light is attached to the rack and the light's wire is run down to below the seat. One of two attachment points for the fender. The shortened fender does it's job of keeping spray off my back, it's sturdy and it doesn't get bagged around by sticking out beyond the rack. The second attachment for the fender is on the frame. The plastic tab on the fender was softened with a torch and bent to fit properly on the frame. The 4 cell lithium battery for the DiNotte rear light is mounted on the frame below the seat. That's all for now more pics coming. I picked up the rolling Catrike 700 frame from Bent Up Cycles and started putting it together. Unlike my other Catrike 700 (dubbed "Black") set up for speed and performance this 700 (dubbed "Red") will be set up for touring and cruising the hood and trails. Unlike my old Catrike Expedition (sold) which I loaded up with stuff this Cat will be kept light. 52/39/24 triple. The 24t replaces the stock 30t chainring. Bottle cage located on the back stay using Catrike rack adapter kit from the Hostel Shoppe. I've been using this method to attach bottle cages for some time now with much success. I painted the metal part of the clamp black. Each clamp requires a small piece of old inner tube under the clamp to ensure a tight fit. Scott Wayland's newest book Cracking the Spine is here. Order it now at Amazon. Also available for Kindle at Amazon. Scott paints a picture with words. His writing style is factual, funny, quirky and it's just a pleasure to read. "Two middle-aged adolescents and their faithful hound, Django the Wonder Dog, tackle the backbone of North America--on tricycles. Blazing heat, freezing cold, horrendous traffic, endless mountains passes.... Can they make it? Will the beer and kibbles hold out? The truth is in the riding." Checkout this beautiful custom VTX design from Utah Trikes. I prefer direct steering on my rides. I wish I could give this beast a test drive. Along with other mods on this beautiful VTX, Utah Trikes removed the factory indirect steering and equipped it with direct steering. 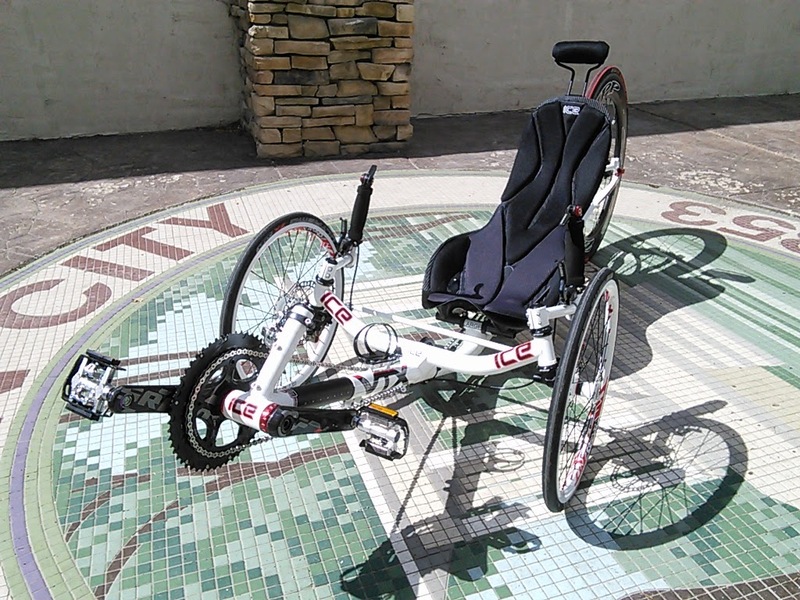 Check out all the pics and modifications here at Utah Trikes. What would I do if I didn't have my Catrikes? Since 2009 the ole bones...ah gee... the whole body seems to have decided to fall apart. My love of hiking is limited to 3 miles. After 3 miles things start getting sore. I remember the days when I use do heavy lifting not only at work but at home. I have long ago retired from construction but I still love to build things, just not such heavy things. Lifting a 100 pound rock and placing it in just the right spot in my garden is no longer an option. Riding my trikes keeps me alive both physically and emotionally (my heart attack while riding my 700 back in 2011 was not the trikes fault). Where I now have some physical limitations in by activities trike riding sets no limits. 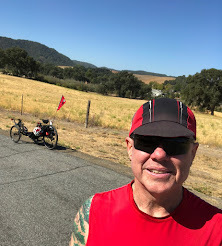 I can ride fast and long and pace or past most other riders or just cruise and enjoy having nothing but sky over my head. 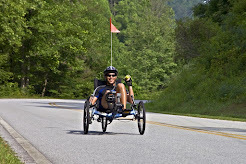 I love riding recumbent trikes. Why conform...enjoy life. Who cares who's looking at you. Ride a trike! !